Maintaining a scratch-free, lustrous paint finish poses quite a challenge to every day driving. Time on the road can be rough on an automotive finish with every mile increasing risks of abrasions, nicks, insect stains, scratches, weathering and road debris. LLumar® Platinum Paint Protection Film is your ultimate defense against these occurrences and eliminates these hazards from damaging your vehicle’s finish. With our highly advanced virtually invisible layer of film, the appearance of your vehicle is enhanced, and its value is preserved. Precision-cut to fit each vehicle, LLumar® Platinum Paint Protection comes in clear or colored film and is applied without any drilled holes or fasteners to deter the beauty of your car. Paint Protection Film is perfect for vehicle hoods, fenders, mirrors and front bumpers known to be most vulnerable to flying road debris. We film your vehicle’s back bumper, around door handles, and other areas that are subject to heavy use and potential damage. 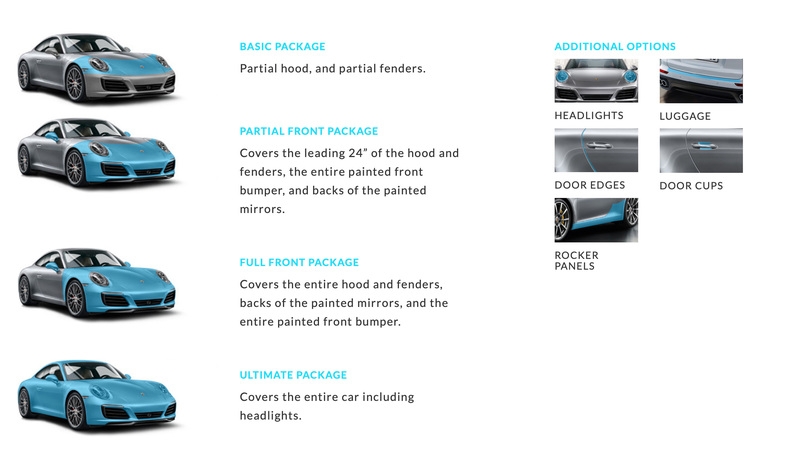 Choose the level of defense that fits your car’s needs in clear protection or full color! Helps to preserve the value of your vehicle with a luxurious, lasting appearance. Transparent urethane film adds greater appeal and provides more protection than traditional black vinyl bras and plastic bug shields. Minimizes need for touch-ups and costly repainting. Adheres directly onto the paint to eliminate debris from getting under the film. HydroGardTM technology that repels water from auto surface. Amazing self-healing properties that enable film to self-repair scratches with just applying heat – the sun’s heat alone works wonders! LLumar has you covered with a ten year manufacturer’s warranty. Because your car’s surface is shielded from nasty road debris and scratches miraculously disappear in the sun’s heat, caring for your car has never been easier. With far less effort than ever before, your car’s exterior will look fantastic and be kept in prime condition for years to come! Add performance to your car that will keep your factory or custom paint finish looking new and flawless for miles!